Casa de Luou is a beautifully furnished house which enjoys from splendid views over the Lima Valley and countryside. It is part of a large estate which produces refreshing Vinho Verde wine. On the estate, there are 3 self-catering villas. Casa de Luou and Casa do Tanque are located close to each other and have to share a swimming-pool. The house has retained the original stone walls whilst the interior has been restored in order to provide comfortable accommodation. The original granite wall has been preserved, guaranteeing cool temperatures in warmer months. The large accommodation is all located on the first floor and has been furnished and decorated in a traditional Minho style. There are 2 twin and 2 double bedrooms, all with ensuite bathroom. The 2 double bedrooms have a small balcony that enjoys from views over the valley. The dining room has also a small balcony. The ample lounge has two separate sitting areas, one has a fireplace. Several large windows provide plenty of natural light on a sunny day. The fully equipped kitchen has a door that lead to the garden. The house is centrally heated. There is a covered area with 2 tables seating 8 persons each. The swimming pool is set in a large lawned garden and has to be shared with guests staying at Casa do Tanque. Casa de Luou is located approximately 6 kms from Ponte de Lima which has several traditional shops, bars and restaurants serving regional dishes. About 800 metres away is the River Lima where it is possible to go for a swim in the sparkling fresh waters. The old sailing city of Viana do Castelo which is well worth visiting is about 20 kilometres away. Viana has many excellent restaurants, bars, cinemas, a shopping centre, swimming pools and a bowling alley. 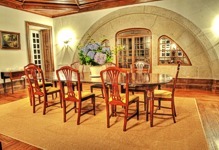 Casa de Luou and Casa do Tanque, which can accommodate another 6 people, can be rented together for large groups or families.